Vasiliev’s final report on Linares 2010 was a bumper round-up of interviews with the participants, including Topalov’s pyramid theory of why he should only play for large amounts of money. – The endgame you lost to Topalov – was it drawn? – Well, it wasn’t such a simple endgame. It’s drawn, of course. But it needs great precision. I think the clever clogs pundits (with a computer at their side) could easily find the draw. But at the board a hundred out of a hundred of them would lose it. – A hundred out of a hundred? – Yes, a hundred out of a hundred. – The endgame will end up in textbooks. The draw, I think, is there, but it’s not as simple as it seems. Playing 48…Ke8 was unfortunate. Maybe 49…Ke7 still saved it… It needs checking. – And overall – what can you say about the tournament? The way it ended, of course, spoilt my mood a little. It looked like the win was in my pocket and suddenly Boris lost that drawn endgame. But overall my mood’s good. Even better that last year when I shared 1st/2nd place with Ivanchuk, because last year I had the impression that I was in “super form” and to a degree over-performed [lit. “jumped above head-height”]. While this year even if I’d won the tournament I’d have considered that that was the way things should be. – What did you think of your play? – I picked up a point or two more than I deserved. I arrived without any opening ideas. Even if normally you don’t manage to use them all, you feel more confident. Arriving the way I did on this occasion isn’t professional. I’ll make things right. – Can I ask why you weren’t at Wijk? – They didn’t invite me, that’s all. – But why did they suddenly decide not to invite you? – It turned out that the organisers couldn’t meet the conditions I proposed. That’s all. – No, no, no! I just thought that it was an easily won endgame, while in actual fact it turned out that I had to struggle… After move 40 I understood that the position was objectively drawn, but I looked for ways of confusing my opponent. – Well, exhaustion finally had its say. I’m not sure about Ke8 – it’s a mistake. It seemed to me that 48…Kf6 was a draw. – No, I wasn’t happy with the quality [of my play]. Even with the four wins I can’t pick one out as a clean win. But they were interesting. – Your games [against Grischuk] were the most tense and decisive. What do you think of them? – In the first I got a promising position, but then I sacrificed incorrectly, he made a few mistakes and I got chances. 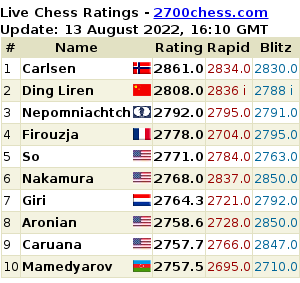 After the 40th move I think that objectively the position’s drawn, but he didn’t play very well and lost. And in the 2nd game I went for a forced variation which I evaluated wrongly. I got an unpleasant position where I had chances of surviving, but objectively it was hard to play. But let me repeat: I’m satisfied with all the games I played here. They were all interesting. – And would you like to play in Moscow? – I have too many invitations. This year I turned down playing in Wijk and Nice. I have to play the Grand Slam final. If they invite me Silvio will think about it. And then, I don’t know what the prizes are in Moscow. Here I earned 75 000 euro, which is almost 100 000 dollars. How much it is in Moscow, I don’t know. – Do you really need the money?